C2E2 has been getting better every year and this year marks the most organized and entertaining expo yet! Tomorrow will be the busiest day of the con and that means you'll need a guide to help you get the most out of your visit. Here's some things to help you filter out the convention confusion. The main big change this year is the inclusion of "The Block" which C2E2 bills as "a show within a show." If you don't count Artist Alley, The Block occupies the very middle of the convention floor and houses tons of artists from the underground culture such as Jim Mahfood (Grrl Scouts, Clerks, Tank Girl), Buff Monster (Juxtapoz, Nylon), L'Amoure Supreme (Mishka, Nike), David Crossland, boutique toy creator Galaxxor and infamous Oakland artist Skinner who has done art for Kvelertak, Every Time I Die and Mastodon. This is an amazing addition to the con and brings some well deserved attention to artists that don't normally make it out here. Visit Skinner at the Critical Hit booth (965) and Jim Mahfood & David Crossland next to him at the Nerd City booth. You can also watch all weekend as Buff Monster and L'Amoure Supreme work on a giant colloborative mural in the middle of The Block. Another great highlight is The Variant Stage near the back with the autographs section. Friday featured such content as a Puppet Show, Stand up Comedy, a theatre stage reading of a comic book, and a Buffy the Musical Shadowcast. Saturday will feature Nerd Trivia at 12:45pm, The Nerdologues Comedy show at 4:30pm and a Cosplay Contest at 5:45pm among other things. As always the best part of almost every con is the Artist Alley. This section is divided alphabetically in rows with the main row/aisle being an expanded section between 'I' and 'J.' This aisle is home to the creators of the Idol Threat featured comic Hoax Hunters. Drop by I4 to say hi to Michael Moreci and Steve Seeley - you can pick up the latest issues of Hoax Hunters or the first trade, and some awesome prints or a mini-artbook from Steve or the amazing new trade paperback of ReincareNATE from Michael. IT faves GregNFake may be absent and in Mexico right now but you may run into their collaborator Marc Koprinarov who will be hanging at the Hoax Hunters booth. Speaking of GregNFake, they have recently did an awesome back-up story to the the Heavy Metal Magazine-esque comic Doctor Muscles comic. You can check them out at the Bogus Books booth at P6. Other Idol Threat recommends include Bill Reinhold (Badger/Punisher) at Q1, Brian Wood (DMZ, X-Men) at O18, Geof Darrow (Shaolin Cowboy/Matrix) at P1, Chris Burnham (Batman) at B1 and Tony Moore (Walking Dead) at A10. On a side note both Doug Manhke (Green Lantern) at A1 and Phil Hester (Green Arrow) at C10 are selling original comic book pages for $20 each! 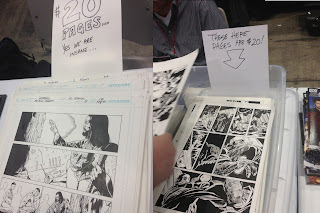 Most artists sells their original art pages for upwards of $50-$200 each so this is an insane deal that everyone should take advantage of. There's also some big time nerd names coming down for the Saturday show. You can see comedian/actor Patton Oswalt in his Q&A panel in the IGN Theater from 12:30-1:30pm or the Ron Perlman (Hellboy/Sons of Anarchy) Q&A in the same theater at 3:30pm. There's many more great panels and guest/exhibitors and your best bet is to plan your attack before heading to McCormick Place (in the West Building btw.) Get there as early as possible since the parking lots fill up pretty quickly, and be prepared for a bag check by security everytime you enter the convention floor. You can see a full layout and schedule on the C2E2 but I HIGHLY recommend downloading their mobile app which has proven to be extremely effective. Enjoy the show.